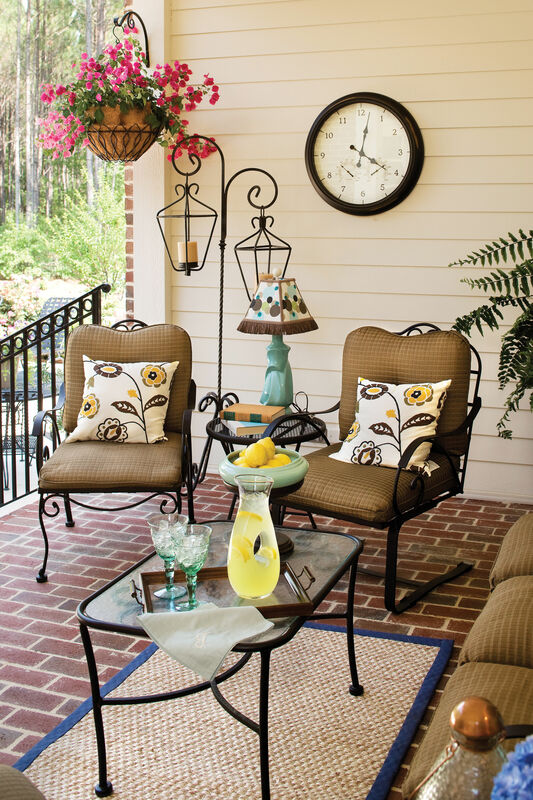 Decorator Cindy Smith of Circa Interiors, Charlotte, NC, designed this back porch with wood, metal, and stone. Decorator Cindy Smith of Circa Interiors, Charlotte, NC, used purple accents in addition to wood, metal, and stone to create a refined, rustic back porch design. 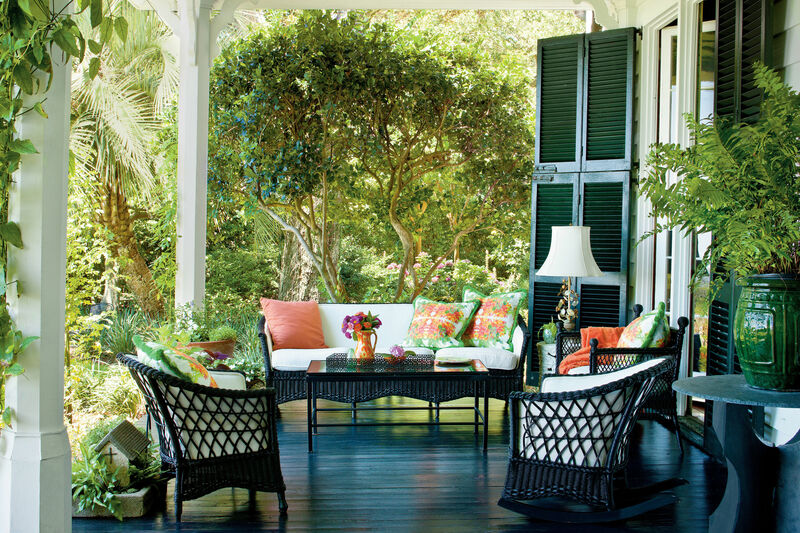 Let the style of your home dictate the design choices on a porch. Cindy selected muted colors and a mix of natural materials to complement this Tudor-style house. Soften a modern look with furniture made of polished wood. "The pieces are angular but actually have slightly curved edges, so the look is sleek, not severe," says Cindy. Coat wood with polyurethane to keep it looking its best outside. Accessorize neutral upholstery with pillows in a strong hue, such as aubergine. Keeping the color to a minimum allows the furniture's strong shapes to take center stage. 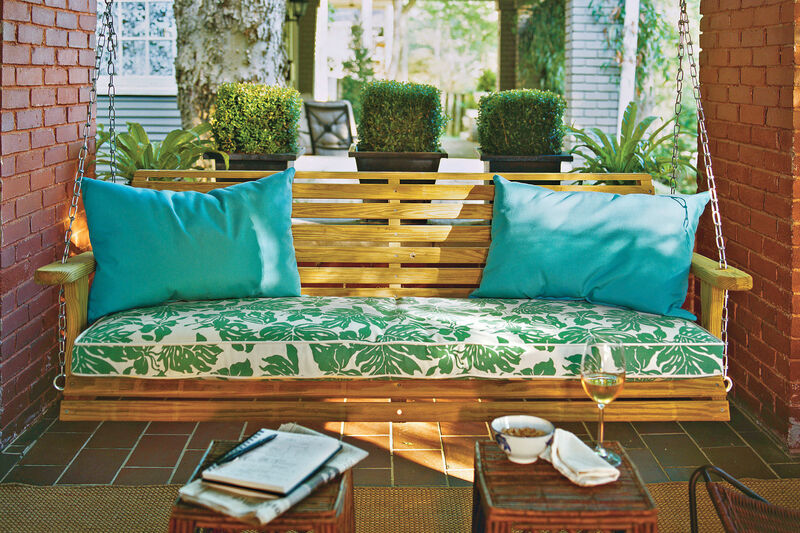 Carve out a cozy, solitary nook by suspending an oversize hanging daybed from the ceiling. The extra-large perch adds an irresistible seating option and is ideal for reading or simply swaying on a balmy afternoon. 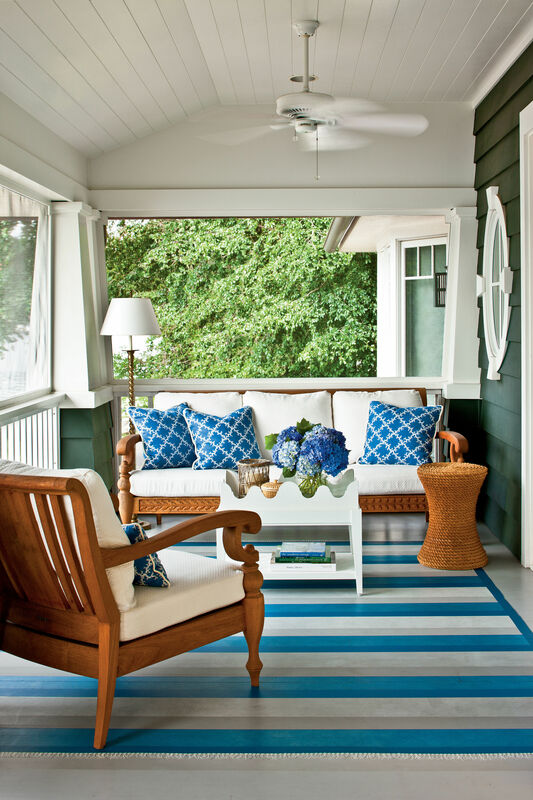 Link your porch to adjacent spaces by using the same flooring. For the porch floor, Cindy chose the same paving stones that surround the pool deck to connect the two spaces visually. 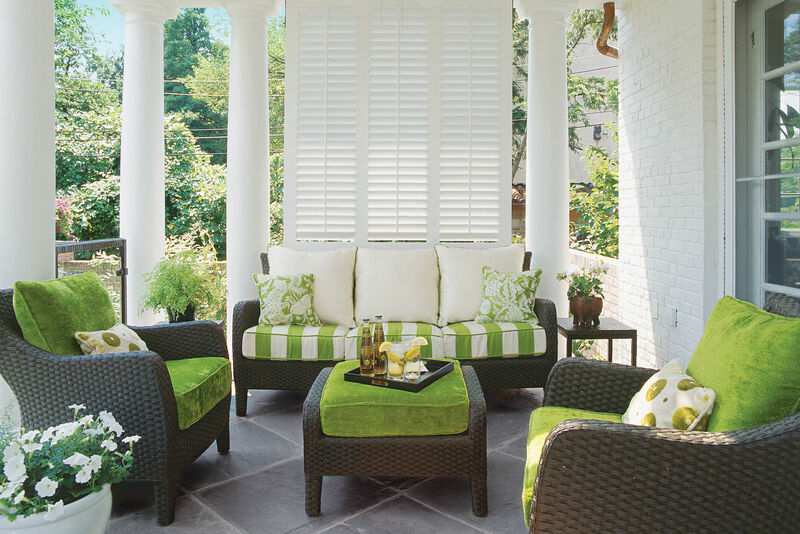 Designer: Cindy Smith, Circa Interiors, Charlotte, NC; 704/332-1668. Architect: Ruard Veltman, Ruard Veltman Architecture; ruardveltmanarchitecture.com. Contractor: Hubert Whitlock, Hubert Whitlock Builders; 704/364-9577. Pavers: Buff; peacockpavers.com. Mantel: Custom-cut Indiana Limestone by Hubert Whitlock Builders; 704/364-9577. Chairs and sofa: Howard Collection and coffee table: Square Root Coffee Table, centralstationinteriors.com. Cushion fabric: Canvas Taupe (5461) and trim fabric: Antique Beige (5422) by Sunbrella (sunbrella.com). Pillow fabric: Canvas Weave in Plum Blossom by Perennials (perennialsfabrics.com). Note: Items similar to all other accessories are available through Cindy's store, Circa Interiors; circainteriors.com.